What this means is that I cant go out and roam around the place. I dont know anyone here and the one or two people I DO know are always busy with other things. People at work are older and there's no one my age in my team. So what it means is that - I dont have any company. Couple this with no email access in office and no internet at home and what we have is what the title of this post says - shorter days of loneliness. I am expecting all this to be over when I move into a new home. I am currently living in the guest house provided by the company. This house-hunting is another pain in the you-know-what thing to go through out here. Till then, all you guys keep commenting and keeping me company. Thank the dear God that I can access blogs in office. 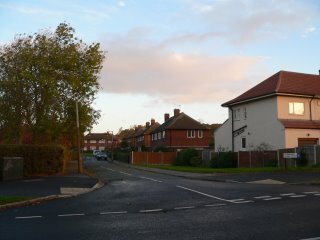 Check out some pics from the street next to my guesthouse and a park (Roundhay Park) that I went to on Saturday morning. Click here. Yep..Totally understand the early pangs of staying away from home..Surely, you will get over it..
btw, Have you had any chance to go to a football or a cricket match? If I am not wrong, the county team representing Leeds is Yorkshire? u live in a place which looks like heaven (atleast in photo!) but still miss home. hmm...guess man is so greedy! hey cheer up man! the pics say that u r livin in a beautiful place! n who says that u have to have ppl of ur own age to give u company! n as Alice rightly says, christmas is coming!!! n the world wud be all white n rainbow colors! frankly speakin, I envy u so now! Be sure to watch a football match at Elland Road. Leeds United was one of the clubs I used to like before it went into the relegation !!! And as boo said...party a lot !!! [:-P] Thanks a lot for the kind words. Will surely get back to being my optimistic self within a week or so. Niah :I know...I AM missing home quite a bit. I call home almost everyday so that isnt so bad. Actually Leeds isnt such a large city, so surprisingly, I havent had as large a culture shock as I expected. It just looks like a cleaner and greener Pune...with smaller roads, surprisingly. HP :LOL dude, shops in Pune DO NOT close at 5:00. Who told you that?? Leeds does come in Yorkshire so your guess is absolutely correct. I stay pretty close to Headingley which I hope is the same one which has a test cricket ground. Will watch a cricket/football match at the first chance I get. Balaji :A point to think actually. The grass is always greener on the other side, huh. Its always been like that - human mentality. Good to see you back in action though ! Alice :Thanks for the advice girl ! I used to do almost all those things you said when I was in Pune. Guess I wont stay away from my true nature for too long. Thanks for the comments and yeah, keep an eye out for more pictures from me. I'm visiting London over this weekend ! Kavita :Beautiful, yeah !! IT really is. All the houses here look like the ones I've always read in my favourite classic novels. Every thing is quite countrysidey where I stay now. Yes Xma will be here soon. Looking forward to it. With it comes extreme cold temperature. Not looking forward to that though. LOL if you envy me that much, why dont you switch companies and get into one which will send you here onsite? Raul :Rahul jii, dhanya bhaag hamaare jo aap hamre blogva pe comment maare ! Where were you all these eons man? Elland road, eh? Will surely check that out. Football, parties hang outs etc will DEFINITELY come, first let me get this shifting thing done with. Another prerequisite for such stuff is good enthu company. All I've seen here till now is a bunch of weird people stuck in the quarter-life, just married or about to and these people seem to have no passions in life at all...besides coding, of course ! Aah...another downslide, no good desi chix [:-(]. You can even replace the 'good' with 'bearable'. I can fully understand what you are feeling.. I was in the same situation when I was in Germany... old people in office alone at home without internet! You don't have language problem.. I had that too... so you can imagine! Hey lotsa luck in the UK, just blog hopping and noticed what you read..wessex tales..is fairly unusual, I was intrigued. Hope you get over the home sickness quick. Sometimes I wonder if its worth being away from the people I care about..
D'oh! Going to london to look at the queen? The place looks gorgeous and unspoilt. Must be way too different from what you are used to ! yup..have the Wessex Tales, and Selected Short Stories by Hardy - I think he is a highly underrated short story writer..critics never appreciated em tho if you ask me the short story is his genre. Noticed you like short stories (Henry etc) - check out Guy De Mupassant, my fav and Saki..both rock tho in VERY diff ways. Cheers, a good book to get over the home sickness works for me everytime! Shark :You wree in Germany? Wow...where exactly were you located and for how much time? It does snow here and I was speaking to the cab driver last night and he said he saw snow up to his waist when he was a kid. Its not that bad now, I think but yes, it DOES snow and its not very comfortable when it does. But yeah...looking forward to that experience as well. Sorry for not posting more often but I will try to do that now. Do keep checking the link. I will keep updating with more photos on that link. Tons of photos from this weekend's London trip are line up for upload. Will do that as soon as I am in the vicinity of an internet connection at home. Reaper :Hey...thats actually a very good and PRACTICAL suggestion. The only problem is again...company. It would be pretty sucky to go to a diner alone every night, you know. But yes, its defi worth a try. Thanks ! Di :Oh yes it certainly is like that where I currently reside. The city centre is like a ...err...'city' though. Somehow its an interesting mix of the countryside and an urban locale. Mellowdrama :Its GREAT to find another Hardy lover. Yes I do read a lot of short stories. I also managed to get my hands on a collection of short stories by Maupassant. Incidentally it was the same guy from whom I borrowed Wessex Tales. The last classic I read was 'The Black Arrow' by R.L.Stevenson and that was many months ago. I actually hate myself for not keeping up with it. I have now though brought 3 books from the council library - Tom Sawyer, Huckleberry Finn and The Island Of Dr. Moreau. All these are childrens' favourites but I haev been wanting to read them coz I read them when I was in school and loved them back then. Thanks for the comment and PLEASE keep dropping by. Rose :No, its not. REALLY. I miss my good old days on the playground with the old chaps. I really do. Sometimes I hate this feeling of slipping into middle age but its good that I had a chance to have a new experience like this one. Zii :LOL, the queen? No man. I am going there to look at the city...d'oh ! Sunset at 4:30? That's crazy! I remember when i first moved and i didn't have internet access i was completely lost! It's amazing how much our lives have become revolved around technology isn't it? It's great your in Leeds though - that's my dad's favourite soccer team - Leeds United, so at least you can join in with the football atmosphere! That would be awesome! Oh and I absolutely adore Tom Sawyer and Huck Finn, they are so much fun to read and i think you can read them no matter what age you are! I was at my princess's blog, and there i came across a comment from you ,statin that you hd come by mine via Claytonia via Alice..phew! So I decided to come by myself.. I know how u feel, i've been travelling coz of work for the past 2 years..now goin to Saudi Arabia on saturday..atleast u are in the UK :)) it shd be much better than Riyadh now, shdnt it??? Will let u know how I fare..
New places are always lonely at first. But things get better, trust me, they always do...Its only a matter of time! Kavi :Hey mate. Yes, it is beautiful and pretty much unspoilt. I guess the major reason for this would be the low population density. Leeds isnt VERY populated, you know. And yes, the English certainly have a little more civic sense than us. Something we should not be ashamed to accept and learn from. Supriy :Yeah man...the weather ! Though since I came here, its not been THAT unpredictable. Its just cold with chilly winds but this is just the start, I hear. It grows REAL BAD in these parts when the winter really sets in. AMY :See that caps? LOL, thats coz I am very happy to see you back here. Leeds united is way down the rankings even in the second league [:-(]Their form has gone down over the years, donno why. But...I will look forward to watching them play sometime or the other. I love football as you would already have known if you read my blog well enough ! Good to see you back, Amy. Shain :Oh boy...Saudi Arabia !! Except cheap electronic stuff, I really dont see any reason why a person would be mad about going to that place. LOL, no offence to any Saudis here but I just think its a very hostile territory for a tropical animal like me. To be fair, so is Leeds ! Scars :Thanks man. I am waiting for that time to arrive. The place is REALLY nice. Its just the lack of company that I hate. You know...people who have no passions in life (my colleagues in office, I mean). I only know a few people here and all of them are people who work late and go home, eat and sleep. On weekends, they sleep in late and laze around at home....not my style, man. I hope I can find some like minded people soon. 'Anonymous':Aunty...so you are alive eh? I thought your plane got hijacked !! SO GOOD to talk to you. You have fun there...dont worry too much about looking out of place...it happens everywhere. Remember 90% of these people wont know who you are or ever see you again ! i dropped here reading your comment "why dont you ever read my blog" in someone's blog. so, you are in UK uh? cool. so, you are alone and lonely uh? cool. so, its winters there uh? cool. so, you miss home uh? cool. so, no access to net uh? cool. i was in the same mood exactly one year back. you will get used to it. hardest being not having net. no familiar faces around. lonely. talk about it. but, you will get used to it. everyone does. Dharmu : LOL, yeah. I did leave that comment on Nirwa's blog, I think. Oooops, I mean Basanti's blog. Oh I would've got over it in a jiffy if only I had any friends over here. I know absolutely nobody. I also make friends pretty easily and I would have made some if there were people my age out here. Yes but as you say, everyone gets over it. So will I. Thanks a lot for the reassurance and thanks for commenting too. I hope you do read my blog once in a while. oh yeah, tell me about having frineds of your age. the place where i work, everyone was in thier 20's some 20 years back. and hey, i am not cooking it up ok? and, you can ping on me anytime. i ll give you tips to do tp. like- count the hair in your boss's nose, throw stones at your neighbours kitten, pick random leaves from random tress and place them back, or take water in your palms and fill a bottle in the kitchen. see, kitne tp ideas hai. i lived all that re. want more? and yeah, me says me will come here often. You had been to the UK or are you just talking about some other place where you had a similar experience? Oh I am waiting for next week when I will have internet connectivity and then I will atleast feel like I am in touch with some people I know ! Bendtherulz :Well, I still havent managed to make anything more than acquaintances. Good thing is that I have had 2 friends visiting in the past two weekends and there's one visiting this weekend too. So I've had SOME company but I dread about what will happen after this weekend ! Reaper :The catasrophe has happened. I cannot access the internet at home using my laptop ! They've put in some internet blocker on it. Bloody buggers...now I will have to BUY my own laptop ! Apy :Good to see you back mate. Where were you all these days? Will you be blogging regularly now? I hope so. Dreamy Eyed Gal :Hey !!! So nice to see you again. Where did you disappear all these days/weeks/months? Need to see a long post from you, fill us up on what you've been upto all this time. hiya...how u doin? wen do we hear from u again? Casa :Thats actually a very good suggestion. But then...I dont drink ! I guess I could start haunting such joints anyhow. Thanks for the tip ! Reaper :Thy wish, is my command. New post is up. Ain't an updated though...just a piece of arbid write-up. Welcome to lonliness. The single biggest killer around here. I dont quite understand how you have access to blogs but no email access ? There are a thousand mail sites out there man! I must say GREAT pics Guns. Really. Autumn can be a beautiful time in these parts. Forgetting the usual gloom and doom of course! Jedi :Thanks for the 'reassurance' dude ! LOL but yeah, its getting colder and darker everyday here. Last few weekends I had friends come over to Leeds and so I had a good time. I have access to blogs in office but I guess they have blocked every site that has the word 'mail' in it and most mail sites obviously have that word embedded into it. I tried a few alternatives but I think they have an intelligent firewall. When are you coming back from India (to the UK, I suppose)?